TO KEEP YOUR THINGS, CORRESPONDANCE, BELONGINGS, VALUABLES, PURCHASES SAFE. We are proud to announce the launch of Smart Digital Lockers, a solution that consists of automated electronic cabinets, a new revolution in secure lockers with a designer look and feel! Smart Digital Lockers delivers an outstanding user interaction with high-definition touch screen, providing the highest level of security while combining high-aesthetics with a durable and secure locker solution. All Cabinets allow multiple configurations and interaction flows available for use cases like, correspondence delivery, luggage storage (rental), vending kiosk, individual personal storage and electronic keychain locker. Access possible via PIN code, RFID card, mobile app, authentication scan via retina / fingerprint / palm reading. 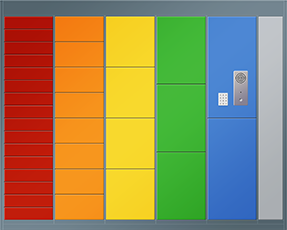 Configurable in several numbers of logical units of lockers, arranged in modules, with multiple colors available, variable sizes and with the overlap of advertising decals. Bidirectional interaction through high-definition touch screen, allowing multiple streams and outcomes in contact with the cabinet. Repetitive manual tasks are automatically assumed by the cabinet, including fault and malfunction detection, ensuring greater end-user availability. Control of conditioned access to registered or known users and alarmist with registration of all activities. A new revolution in secure lockers with a designer look and feel! This range of Lockers integrate various sizes of automated electronic cabinets directed at the reception of corresondence in buildings with multiple tenants. It is designed to work with the aid of reception security personnel or autonomously substituting the traditional mail boxes. It brings the advantages of being able to recieve parcels of multiple sizes, alerting the recipients, in real time, about the delivery of correspondence, and optionally (depending on the implemented workflow) even recieve a fotograph of the parcel or letter that was delivered. These lockers have the ability to make available virtual door numbers, extending the services a building can provide to tenants or other entities. Some straight forward examples would be a Cowork facility where they rent out virtual correspondence addresses, or a way a company office building could automatically departmentise the reception of correspondence or even make their address available for employees to recieve personal correspondence while maintaining their privacy. These Lockers consist in automated electronic cabinets designed to store individual belongings and/or tools or safety equipment in a work environment. It comes equiped access control and integrates with various forms of identification, it could be RFID cards, pin codes or other means, all managed through a backoffice tool. It integrates an alarmistic system that can be integrated with notifications in pagers, mobile apps or mobile phones. Usage logs and statistics are made available in the backoffice tool and can be exported to or integrated into other systems. The cabinet can have multiple configurations of locker sizes, a standard locker has 36 doors but can be expanded up to 9000 doors. Renting out a secure place for storing personal belongings in events or recreation areas is the objective of these type of lockers. They are designed to be fully automated and will accept physical money or credit/debit cards depending of the implemented workflow. The cabinets are available for indor or outside use and are designed to withstand vandalism attempts. As an option, these lockers can be equiped with mobile phone chargers, or just USB sockets. These cabinets will require access to electricity for it to fully function. The default configuration will grant access to the Locker by using a personal pin, but other options are available. The renting can be prepaid, and require further payment if time exceeds the rent paid, or, when using payment by credit/debit card it can be charged only when rental is concluded by the user. This solution consists of automated electronic cabinets por storage of personal belongings (baggage, groceries, etc. ), or as self-service drop-off and collection point. This Locker type can be equiped with a VOIP voice intercom to aid the end-user. It supports cash payments or credit/debit cards. It can be equiped with various security features, like the anti-vandalism keyboard, alarme system and CCTV cameras to dissuade vandalism and theft, which confers it the possibility of being located in a wide range of places, even in places without human supervision. An inclosed printer gives the receipts at the time of usage, and it can connect to the internet for remote management through a backoffice. This type of Lockers are automated electronic cabinets for the individual storage of goods in school environments, with access control and alarms, configuration and user management are exectuted via backoffice. These Lockers are, essentially, destined for school buildings, and the cabinets allow for multiple configurations, they provide an internal 220v socket, for recharging laptop PCs, and 2 USB ports for recharging mobile and portable devices. The multiple configurations and multiple colors allow for a multitude of adaptations to a wide range of scenarios. The lockers can have a wide range of sizes that allow for storing items of almost any shape or size, the various sizes can be mixed to permit customer choice or an automated choice for an efficient use of space. The various colors, whether the default color range or any custom color required by the customer, make the lockers easily integrate any space or environment, or stand out and make people notice their presence. The availability in multiple colors have an easy usability, where it can be simply to reflect the customers branded colors, extendabled by the use of printable resistant vynil coating for logo representation or any other form of communication, or any other design driven reason, it is a fundamental customization feature. The multiple sizes available give the possibilty to store items of different dimensions, you can provide space to store items ranging drom surf boards to mobile phones. 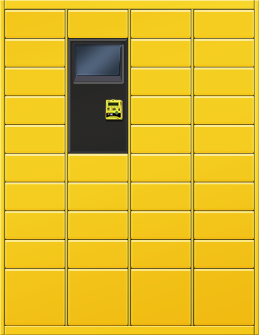 Configurable in several numbers of logical units of lockers, arranged in modules, with multiple colors available, variable sizes and with the possibility of advertising decals. These Lockers are specially designed for outdoor use, either as a fixed cabinet in a public location, or as trasnportable cabinet to aid in storing users belonging in ocasional events. It's primary design is for use at a beach scenario, making it possible for the users to store all belongings while they enjoy the beach. Similarly it can also be used in concerts and festivals, Theme Parks, public pools, etc. It is fully automated and the user does all interaction through its touch screen, this does mean however that it does need electricity to power its electronics, so a power source has to be available in the proximity. 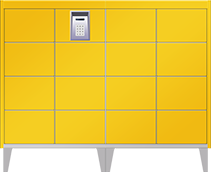 A user can rent out a locker using two different workflows, with a pre-paid amount of rental time or with an undertimed rental time that is paid when the rental is closed. The second use-case has the user submit his credit or debit card for validation and it will be charged when the user closes the rental actively by choice. Both use-cases will inidicate to the user of a maximum charge of 20€ (or equivalente) which is the maximum chargable amount with wireless pay. 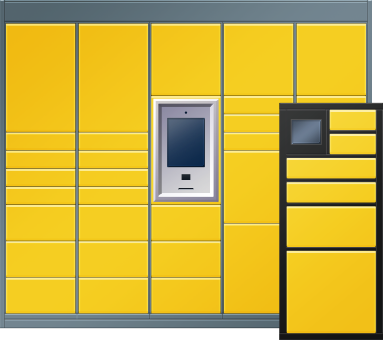 This type of locker will automate the delivery of goods and corresondence in a variety of scenarios, it is equally usefull as a drop-off point for internet based vendors to deliver purchased good to their customers or as a common delivery point in office buildings with multiple tenants. It is even possible to acomodate for virtual office addresses. 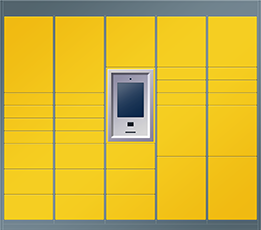 These Lockers are internet, or network, connected and can be configured to notify the recipients of the delivery in real time by email, sms, a custom app, or any other means. Versions of these lockers are suitable for outdoor use, as well as indoor, it comes equiped with touch screen and inbuilt camera, that allows for taking picture of delivered goods, security cameras are available as an extra and, apart from needing to be connected to a power supply, it comes equiped with an UPS that will alert when there is a perlonged power outage. One frequent use case for this type of Locker is it being used in co-working facilities whith virtual office adresses. It is common to have a centralised reception desk accept the delivery of goods or correspondence and then these recptionists will place the delivered goods in the Correspondence Delivery Lockers for each recipient. In the process, they use the ability to take pictures of the delivered goods and, if there's un-picked up correspondence, the system will prompt to re-open already used compartments, for space efficiency purposes, the user will evalute if the compartment will have space for the new delivery. Meanwhile the recipients have recieved an SMS and email with a Code for collecting their correspondence. In the email they recieve also the photographs of the delivered correspondence, which will allow for them to prioritise their time and see how important the correspondence is to them. Since the access to open the locker compartment is done by using a code, the recipients can share that code with someone else that they trust to pick-up the delivered goods. This can, of course, be done 24/7, provided they have acess to the cabinet 24/7 also. Locations like Train Stations, Metro Stations, Bus Stations, Airports, Shopping Malls or any other place with a large number of daily visitors are the ideal location for theis type of Locker. It conviently provides a means for a user to temporarely store safely their pocessions, allowing them to carry out their activities with out the assle of carrying arroung large amounts of luggage. A great location where this type of Locker can be used is in a Shopping Mall that has public transport terminal. 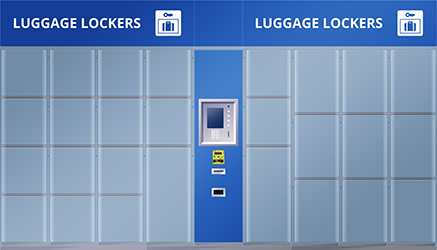 People that have arrived or are waiting to catch a connecting transport and have time to spare, can use these lockers to store temporarily their luggage and go and visit stores and do some shopping. The Lockers will accept physical and digital money, give receipts and have an intercom system that will provide online access to a support desk. These lockers are designed to cater for the storage of smaller, personal items for the individual use in multiple scenarios. They come equiped with see-through or opaque doors, which either show or hide the stored content from the users. Internally they can be equiped with power or USB outlets for recharging small appliances. The usual mecanism for acessing and openning each compartment requires an RFID card and be combined with a touch screen and card dispenser for use in a comercial model, its default use is for factory scenarios. The solution consists of automated electronic cabinets for the individual custody of goods in school environments, with access control and alarms, and event and user management via backoffice. The focus of this use case is for school buildings, where the cabinets allow multiple configurations with internal access to a 220v socket and 2 USB inputs allowing the loading of mobile and portable devices. The provided outlet will permit recharging of mobile nad portable devices, incluing notebooks. Got an ideia for a use case?